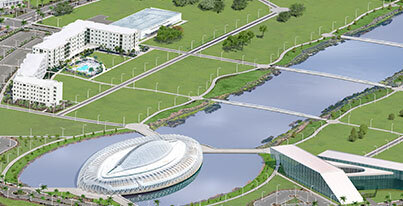 LAKELAND, Fla. – Florida Polytechnic University is appropriated $5 million in the State Legislature’s education budget to begin work on a brand new Applied Research Center on its Lakeland campus. The center will house research laboratories, teaching labs, and offices for Florida Poly faculty and students. It will also be the home of the Institute for Technology Entrepreneurship, which will help commercialize products and systems created from the University’s research. The $5 million that was approved as part of the Legislature’s education budget will allow Florida Poly to begin the planning and architectural work on the center. The center will be the hub of applied research by faculty, students and industry partners. It will provide researchers with state-of-the-art facilities and equipment for working on some of the most vexing technology related problems facing society. The center’s funding must still be approved by the full House and Senate and then signed into law by Governor Rick Scott. This center was Florida Poly’s top priority for the 2016 legislative session. The center will be located on the Florida Poly Campus in Lakeland just to the south of the iconic Innovation, Science and Technology building. It’s anticipated the Applied Research Center will be completed by the fall of 2020. In addition to the Applied Research Center funding, the education budget also provides Florida Poly $2.5 million to fund the operations of the University’s Institute for Technology Entrepreneurship; as well as $1.5 million for anti-hazing programs. The Institute for Technology Entrepreneurship will provide the support needed for faculty and students to start companies, patent their innovations and create high-paying, high-tech jobs. In addition, researchers will meet individuals and firms who specialize in funding startup technology ventures.